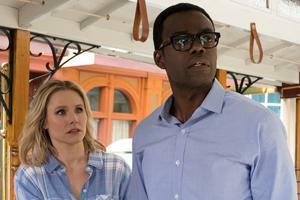 Eleanor (Kristen Bell) and Chidi (William Jackson Harper) in "The Trolley Problem" episode. Credit: Colleen Hayes, NBC Universal. NBC’s TV series The Good Place is a peculiar mix of contradictions. It’s a show about death that leaves its viewers inexplicably happy. Moreover, it’s a breezy, ebullient, half-hour sitcom that’s conversant in academic moral philosophy. If you Google network TV programs that deploy the names “Kierkegaard,” “Kant,” and “Hume,” you’re unlikely to get many hits. In fact, The Good Place creators consulted with two contemporary philosophy professors, Pamela Hieronymi at UCLA and Todd May at Clemson University. And it’s become popular with other academics, including faculty members in American University’s College of Arts and Sciences. Assistant philosophy professor Asia Ferrin is a fan, and graduate students in her Ethical Theory seminar wrote midterm papers about the show. Mark Schaefer, the university chaplain and an adjunct professor in the Philosophy and Religion Department, never misses an episode and talks about it with colleagues in Kay Spiritual Life Center. In interviews with University Communications and Marketing, Ferrin and Schaefer discuss how the show explores serious philosophy in delightful and engaging ways. Warning: Seasons one and two spoilers ahead! Where Shall Goodness Be Found? After Eleanor (Kristen Bell) dies, she realizes she’s been sent to the afterlife “Good Place” by mistake. Her soulmate, Chidi (William Jackson Harper), had been a moral philosophy professor on Earth, and he tries to teach Eleanor how to be a better person. The shocking first season finale reveal is that Chidi and Eleanor were never in the Good Place—despite the gorgeous pastel-colored villages and unlimited frozen yogurt—but banished to the Bad Place. With Chidi’s history of moral exploration, he appears to be a more ethical individual than the accidental-Good Place-occupant, Eleanor. But we learn that they’re being judged the same way. That begs the question—riffing off Immanuel Kant—of whether edification and the earnest study of ethics can make you ethical. The show pokes fun at Chidi: Despite the knowledge he’s amassed, he’s paralyzed by indecision. The Good Place features an intriguing thought experiment called the Trolley Problem, devised by British philosopher Philippa Foot and taught by Chidi. You’re riding on a trolley that’s about to kill five people. But you can personally pull a lever, steering the trolley onto another track and killing only one person. What would you do? Early on, the demon-neighborhood architect Michael (Ted Danson) notes that few people end up in the Good Place. And the main characters on the show are constantly being judged, in what Schaefer describes as Karmic justice. “That’s not a particularly Christian worldview, because Christianity relies a lot more on grace than earned merit,” he says. If it appears to echo retributive justice in the Old Testament, Schaefer says the Hebrew scriptures are different from the merit-based evaluations we see on The Good Place. During a recent episode, there’s a noteworthy exchange between Michael and the omniscient Janet. Michael cooks up another harebrained plan to manipulate his human-subjects, but she insists that he can’t keep meddling in their lives. “It’s time to park the snowplow and trust that the humans will make progress on their own,” Janet says. Is this a debate about how much a higher power and fate intervene in our lives? As issues of predetermination are introduced, The Good Place also examines whether people change. Ferrin notes how even the demon Michael achieves moral growth, eventually trying to help save the souls of the four main characters. The characters on The Good Place aren’t depicted as evil or saintly, and they’re left figuring out how to coexist. Michael admits his original plan was to put disparate personalities together, so they’d drive each other crazy. Yet these polar opposites adapt as soulmates: Chidi, the erudite college professor, and Eleanor, a hard-drinking misanthrope; and Tahani, a socialite who hobnobs with British royalty, and Jason, a dimwitted slacker only devoted to the Jacksonville Jaguars. Series creator Michael Schur highlighted the value of community on his other shows, such as The Office, Parks and Recreation, and Brooklyn Nine-Nine. And while The Good Place meanders and often subverts expectations, that might be the show’s overarching theme.